The focus of this issue of the Journal of Genomics is on adipocyte biology. It might be easy to simply think about adipocytes as those "pesky" cells that conspire against us to fill with fat as we age to make us look differently. Upon a closer look at adipocyte cell lineage origins, physiology, bodily repository locations (depots) and also at the adipocyte's ability to perform a diverse set of metabolic functions other than just simply to "pad" our bodies (especially in the wrong places), it might be surprising to learn that adipocytes have profound impacts on a variety of major bodily systems beyond just lipid storage [1-3]. Consequently, a focus of this issue of the Journal of Genomics was to shed light on adipocytes, bring adipocyte biology into the molecular level and to identify gaps in contemporary understanding of various aspects of adipocyte biology--especially with respect to adipogenesis (genomics, transcriptomics and metabolomics) . By doing so, we hope to generate enthusiasm in this research area and to (perhaps) recruit more people into the arena of adipocytes. One area that was presented in numerous papers of this issue as segmented informative bits [5-8] was the potential for cells found in adipose depots to become other cells, so the "stem cell(s)" of adipose tissue is/are briefly discussed by this paper. Mesenchymal (and perhaps other germ layer-origin) stem cells [9-13], adipofibroblasts [14, 15], stromal vascular cells , preadipocytes [6, 16, 17], satellite cells [10,11] and (even though considered post-mitotic)  mature adipocytes [19-39] all provide cells that can assimilate lipid and display lipid metabolism [17, 40, 41]. Cells such as bone-derived cells not originally displaying the adipocyte phenotype might be induced to become an adipocyte [18, 34, 42, 43] and numerous maladies such as lipotrophic muscular atrophy (a good model is Japanese Black cattle)  and steatosis [2,17] have been described whereby original tissue was replaced by adipose-like cells perhaps regulated via intercellular signals/cross talk between muscle and adipose tissue/cells . This results in cells losing their original function while maintaining original tissue size and structure . Embryonic development. In a similar manner to the development of skeletal muscle in utero, it seems likely that embryonic adipogenesis may involve numerous populations of stem cells . Since the proportions of embryonic/fetal stem cells for the production of adipocytes may be altered , it would be of interest to determine if the same relative proportional changes observed during in utero development are maintained throughout postnatal growth. Enhanced understanding here might point to means for augmenting specific populations of "desired" adipocyte-like cells to the exclusion of others [1, 13, 41]. Postnatal development and growth. The choice of a particular type of adipocyte-like cell to identify putative markers of cell physiology transitions from proliferative cells into cells that are conducting lipid metabolism needs to be carefully scrutinized and weighed [10, 40]. Indeed, sorting out the subpopulations of cells within adipose depots will allow more a discrete definition of such pathways, while allowing a determination of how "flexible" the population might be for other applications [17, 41, 47]. Inclusion of different sizes of mature adipocytes [48, 49], or their dedifferentiated progeny cells  in many of these types of studies will help define whether differentiation really exists, as traditionally defined, or whether we will need to reassess adipogenesis from all sides [12, 29, 40]. In addition there may be species dependent functional characteristics that could impact such studies. For example adipocytes in avian adipose tissues do not exhibit de novo fatty acid synthesis while de novo fatty acid synthesis may occur at high rates in mammalian adipose depots . The work of Prunet-Marcassus et al. (rodent cells, ) and Planat-Bernard et al. (human cells, ) first suggested that adipose tissue contains a number of progenitor cells of several cell phenotypes. Most remarkably, these authors demonstrated that adipose tissue cells can give rise to adipocytes, osteoblasts, myoblasts, endothelial cells, and hematopoietic cells among other phenotypes . This has raised numerous speculative biological questions. For example, is the cellularity of cells that form what appear to be lipid-filled adipocytes, as well as the mature adipocytes that might lose lipid and become proliferative-competent progeny cells, phenotypically "flexible?" Also, are isolated adipose-derived cells capable of forming many (other) types of cells? Ability of different types of cells to form adipocytes. Postnatal adipogenesis and mutilineage potential of adipose tissue. 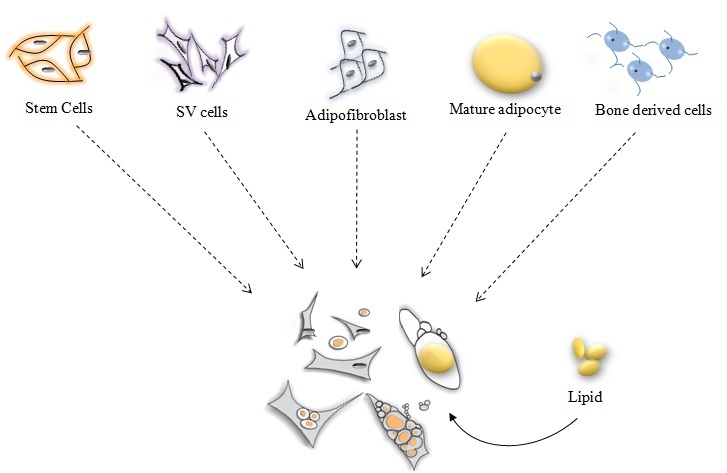 In postnatal adipose tissue (1), mesodermal cells (2), stromal vascular cells (3), mature adipocytes (4) and progeny cells (5) are all involved in the adipogenesis process. Stromal vascular cells (3) are a mixed population, which contain preadipocytes, fibroblasts, endothelial cells, blood cells, macrophages or mesenchymal cells, etc. Traditional adipogenesis refers that, under signal regulation, stromal vascular cells or mesodermal cells could differentiate into round mature adipocytes (4). However, recent studies have showed that mature adipocytes could dedifferentiate into progeny cells (5) and these cells would redifferentiate into mature adipocytes under the proper situation. Mesodermal cells, stromal vascular cells and progeny cells are somewhat similar. Under certain conditions, these cells all have the ability to proliferate and could differentiate into many types of cells [such as adipocytes (6), osteoblasts (7), myoblasts (8), endothelial cells (9) and other types of cells (10)], eventually developing into fat, bone, muscle, endothelial, and other possible tissues. Numerous studies have already provided evidence to address these questions, and adipocyte-derived cells from numerous sources appear capable of forming many other types of cells [5, 6, 10-12, 17, 26, 30, 33, 41, 48, 53-59]. Moreover, in general it has been estimated that adipose tissue may provide numerically higher amounts of stem cells  for use in a variety of applications than any other stem cell source of the body [26, 47, 61, 62]. Also, the phenotype of adipose tissue-derived cell populations distinguishes adipose tissue depots from one another . Collectively, cells derived from adipocyte populations may serve as a smorgasbord of progeny cells for biotechnology, tissue engineering, surgery, direct tissue repair (regenerative medicine), and thus serve as a cell supermarket [10, 12, 26, 37, 46, 53, 59-61, 63-67]. The choice of species for the most promising model to study certain aspects of adipogenesis and trans/dedifferentiation by individual workers is likely highly dependent on the animal resources of an institution. The availability of multiple species, in particular farm animals, would offer potentially a highly diverse/smorgasbord sources of cells. While such species (in addition to rodent and cell lines) are generally available at institutions with agricultural and veterinary colleges, such an approach may not be realistic for mainstream biomedical research centers. Here the principal cell resources and infrastructure may only accommodate rodent tissues, human tissues and cell lines. It would also appear that for commercial application, adipose tissue related cells from farm species would for the foreseeable future be available only as primary cells. In additions strategies and means would have to be developed for rapid distribution of harvested cells. Unfortunately unless there are overriding experimental model advantages for use of farm animal cells, the majority of workers in this field would continue to use rodent tissues, cell lines and available human adipose sources. Most likely if the majority of the work alluded to here would be done with rodents, then most of potential funding then would also be focused on these species. This then will place the institutions with extensive animal resources, including farm animals at a strategic disadvantage to pursue this line of research from a comparative perspective. The quantitative rate and extent (success) of cells derived from adipose depots to become transformed into other types of cells must be examined more closely. Not only is it important to determine if the cells can transdifferentiate, but whether there exist populations of these cells, whose proportions might be increased/decreased with lifestyle choices such as type of diet, amount of energy intake and level of exercise. In this respect, identification of the regulatory mechanism(s) involved in transdifferentiation is essential for understanding the cell physiology involved . Are some adipocyte subpopulations more capable of serving different and useful roles? For example, research data are presently not available to predict what type of transdifferentiated adipocyte-like cells (and regulators) would be most beneficial to aid bone repair in a clinical setting versus a different set of cells and regulators which would be more advantageous to applications such as cosmetic surgery. Considerable number of studies with human adipose tissue stromal/stem cell clearly demonstrated the nature and function of adipose tissue stromal/stem cell progenitors (ADSC) of vascular entities like endothelial, perivascular and smooth muscle cells involved in angiogenesis and vasculogenesis. A novel vascular stem cell (VSC) theory proposes that ADSC are a mixed population of VSC with differential potential proportional to the angiogenic potential of the vasculature . The differential potential of VSC can range considerably in a continuous as opposed to a discrete fashion and can include vascular smooth cells, endothelial cells and adipocytes . 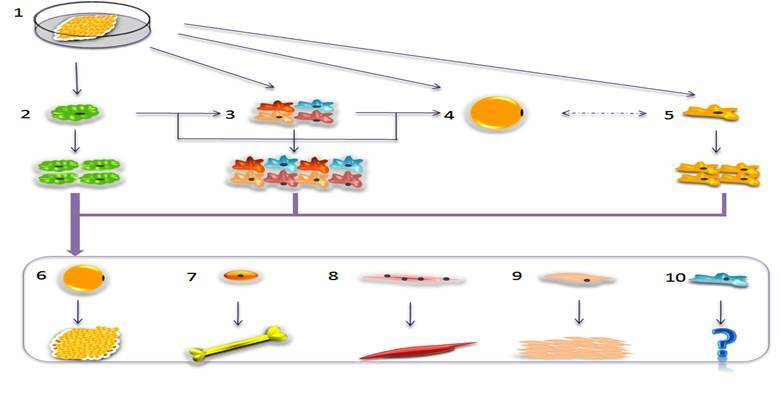 ADSC are likely VSC at various stages of differentiation toward becoming smooth muscle and endothelial cells. At earlier stages of differentiation VSC can also differentiate in situ into host tissue-specific cell types such as adipocytes in their native tissue. Finally, depending on its differentiation potential at the time of isolation from the host tissue, an individual VSC may be induced to differentiate into additional cell types such as osteoblasts and chondrocytes. Therefore, ADSC may exist in adipose tissue as a mixed population of VSC as opposed to strictly as adipocyte stem cells. These emerging realities of cellular heterogeneity (pluripotent vs. committed cells for example), differentiation and trans/de-differentiation potential need further investigation. The general characteristics of stem cell development to committed and finally differentiated cells have been described. Presently we are focusing on the potential of adipose tissues as a source of stem and other recommitted cells for further study and future clinical applications. Unfortunately the extent of our understanding of stem cell biology is still too limited to envision how a rich source of such cells (as adipose tissue) may be utilized in therapeutic programs in future clinical settings.